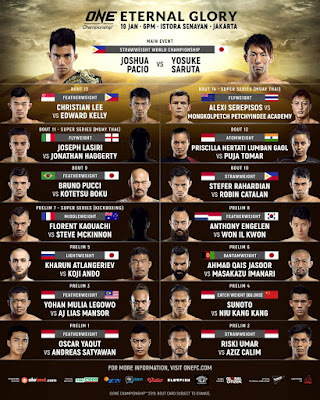 ONE Championship returns with its first event of 2019 from Istora Senayan in Jakarta, Indonesia on 19 January. After more than a month since the promotion's last event, ONE: DESTINY OF CHAMPIONS, fans of the organization will be eager to see ONE return. The ONE: ETERNAL GLORY card isn't packed with every household name on the roster, but there is still no shortage of stories fueling every match. Aside from being hungry for martial arts action, here are five reasons to watch ONE: ETERNAL GLORY. Initially, Joshua "The Passion" Pacio was scheduled to defend his title against Hayato Suzuki in a rematch of their August 2017 clash at ONE: KINGS AND CONQUERORS. However, Suzuki suffered an injury. 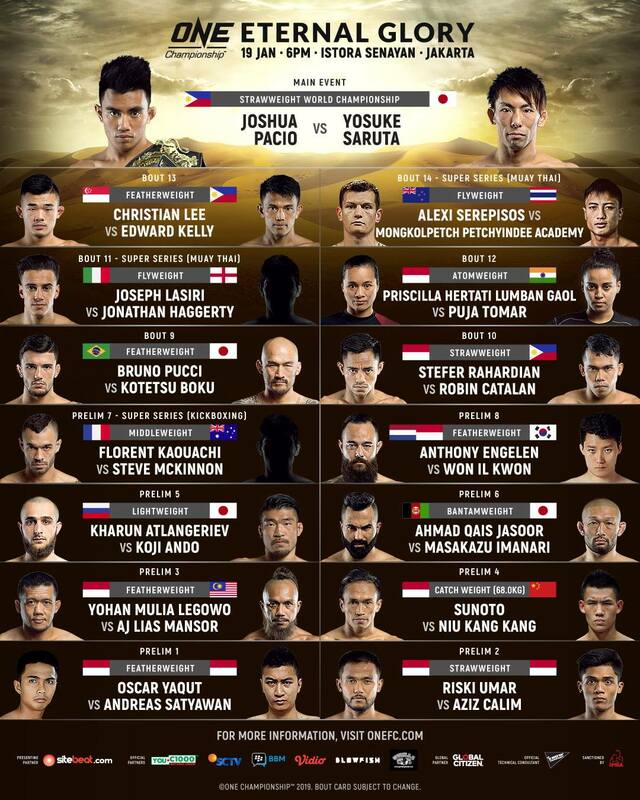 Japan's Yosuke Saruta stepped in to replace his injured countryman and is now the man receiving a title shot. The 22-year-old Filipino already equaled the score with Yoshitaka Naito with a unanimous-decision win in September at ONE: CONQUEST OF HEROES. He was supposed to even the score against Suzuki in a rematch. Suzuki was the last man to defeat Pacio when the former made his ONE debut in August 2017. Pacio cannot afford to look past Saruta however. The 31-year-old veteran has a wealth of experience and will likely be looking to catch the champion slipping. Saruta has had 26 professional matches, and he enjoyed a successful ONE Championship debut in December against Alex Silva. Saruta isn't a normal replacement opponent, and if the champion takes the challenger lightly, it could be a disaster for him. Can Pacio maintain his focus and avoid the upset? We're along for the ride as 20-year-old Christian "The Warrior" Lee continues his hardline education in the world of mixed martial arts. His next assignment takes place at ONE: ETERNAL GLORY when he takes on the "The Ferocious" Edward Kelly in a rematch of a bout that ended controversially in September at ONE: BEYOND THE HORIZON. Lee suplexed Kelly inadvertently causing a disqualification. There are recurring themes for this match. Will Lee be able to control the match the way he did in the first meeting, and gain the finish to put a stamp on this short saga with Kelly, or will the Filipino rise to the occasion? Both men face pressure to perform because of the success of those closely associated with them under the ONE banner. Lee is the younger brother of ONE Women's Atomweight World Champion Angela Lee. Kelly belongs to Team Lakay where his training partners include Pacio, ONE Lightweight World Champion Eduard "Landslide" Folayang, ONE Flyweight World Champion Geje Eustaquio and ONE Bantamweight World Champion Kevin "The Silencer" Belingon. It's a lively time for Filipino martial arts, and Kelly wants to earn his piece of the success. Priscilla Hertati Lumban Goal was as active as anyone in ONE in 2018. She competed six times and put together a sterling 5-1 run during that stretch. Lumban Goal is back in the organization's first event to embark upon what she hopes is another fruitful year. The Indonesian National Wushu Champion faces another expert Wushu practitioner in Indian champion Puja Tomar. The women's atomweight division could be headed for some transition if Lee moves up to strawweight permanently. That's a genuine possibility as she is set to challenge for the title in March at ONE: A NEW WRA. If that happens, a scramble to compete for the vacant title could well include the winner of this bout. With integral positioning potentially at stake, Lumban Goal and Tomar may be set to put on a show. Italy's Joseph "The Hurricane" Lasiri returns to compete against England's Jonathan Haggerty in a ONE Super Series Muay Thai match. Lasiri is one of the most accomplished Muay Thai competitors in the world. He's won world championships in multiple weight classes and he uses a style that is traditionally fan friendly. He'll get a chance to test his exquisite striking against Haggerty in a bout that could feature a highlight-reel finish. Stefer Rahardian, a student of the legendary Carlson Gracie, to match up against the Philippines' Robin "The Ilongo" Catalan. It's a strawweight battle that should have fans interested from the outset. Rahardian has an elite-level Brazilian Jiu-Jitsu base from his time with Gracie, but he has expanded his game beyond just grappling. He's already won the ONE Indonesia Flyweight Tournament which was a mixed martial arts contest. While his striking has improved, Rahardian will likely need to lean heavily on his Jiu-Jitsu to beat Catalan. The latter is a former Wushu and Muay Thai world champion who would love nothing better than to keep his bout with Rahardian standing. Which man will win the battle of styles?